Cornwall boss Graham Dawe says the Duchy will face tougher tests to come after their opening 65-22 County Championship win over North Midlands. 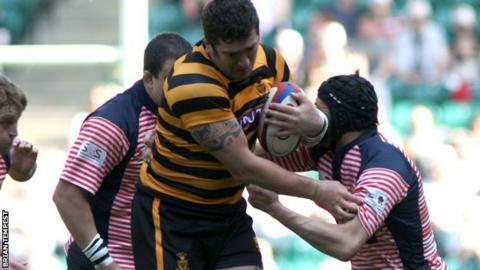 The Black and Gold ran in 10 tries at Redruth's Recreation Ground to put them top of their group. "There's bigger mountains to come," Dawe told BBC Radio Cornwall. "We knew that this was an unknown team, but a team we could hopefully get a win from," added Dawe, after his first County Championship game in charge. Tom Notman scored twice for Cornwall, who also forced two penalty tries, while Lewis Vinnicombe, Greg Goodfellow, Rhodri McAtee, Jamie Salter, Chris Fuca and Lewis Paterson also crossed the whitewash. Kieron Lewitt kicked 15 points as Cornwall prepare for a tough test against Gloucestershire next week at Camborne. Gloucestershire know they must win to keep their hopes of making the final at Twickenham alive after losing 30-19 at home to Hertfordshire. "It was a good game, the boys started the game well, they had a good attitude and I was really pleased with that," Dawe said. "There are a few things that need to be worked on and hopefully Ian Morgan, myself and everyone else can see that and try and talk to the players and try and get it a bit better."